American Zen was founded in 1992 when Coyote moved to Salt Lake City, Utah. Prior bands included The Rich and Coyote in a Graveyard rock opera. Coyote is also Buddha Zhen who records Tai Chi and Kung Fu music. Shaolin Records is releasing the acoustic solo recordings of The Coyote under the new band name, THC The Hippy Coyote, and starting in 2011 has been billed as "Kung Fu Cowboy," not American Zen, when performing live. American Zen auditioned "33 Bass Players" in Utah before Coyote decided to be the invisible bassist for live performances in Salt Lake City. Shaolin Records rented an 8-track recorder and Coyote laid down the bass tracks and then decided to add some background vocals also. These recordings may be first time Coyote recorded harmony basses. When American Zen performed in Salt Lake as a trio, they sounded huge! 3-part vocal harmonies and Coyote's bass mysteriously pounding out of the PA system made the other local bands really take notice. But then the Church of Latter Day Saints got word of this "California Hippie who teaches Buddhist Kung Fu." The guitarist was told by the Mormon church leaders to quit this "Buddhist rock band." The drummer's father was a preacher who... so Coyote decided to record an album all by himself, pretending to be all four bandmates. The LEVEL 1 = Peace of Mind album was recorded on a 4-track recorder with Coyote pretending to be all four musicians: The Coyote, Tom Calder, Steve Hixon, and Rory G.
The LEVEL 2 = Christ Killer album was recorded on the same 4-track recorder as LEVEL 1 and both albums were sold as cassettes to students and fans in Salt Lake City, Utah during the 1990s. Before the album was released on CD in 2007, Coyote transferred the 4-track recording into ProTools and added some more percussion and vocals to the album. But not drums: Coyote was striving for a new "folk rock sound" for American Zen. Unfortunately, by 2008, folk rock had proved to be a dead genre. Coyote couldn't resurrect it. So LEVEL 3 = I Want You to Love Me became Coyote's pathway back to classic rock ("All Around the World"), hard rock ("Musical Woman") , pyschedelic rock ("In Dreams") , now performing more on electric guitar than acoustic guitar. Coyote also emerges as a real drummer for the first time on his new custom built drum set. The songs of LEVEL 3 are more human than spiritual so this is the most commercial album thus far for American Zen. Coyote also invented "BASS POETRY" on this album with up to three Rickenbacker basses playing behind 11 spoken word recordings. 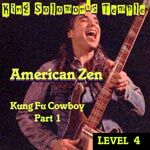 LEVEL 4 = Kung Fu Cowboy PART 1: King Solomon's Temple is the first half of 36 songs recorded for the album. During 2009 Coyote was studying for his 3rd Degree Proficiency Test as a Master Mason of Panamericana 513 lodge in Los Angeles, California. Coyote was the organist of the lodge, performing nightly during the ceremonies on flute and acoustic guitar. It was after one of these mason meetings that Coyote lost his Alvarez 12-string ascoustic guitar. Coyote discovered, "Masonic Kung Fu," and wrote a novel based upon his initial research into this "lost treasure of China" that illicitly taught Chinese Kung Fu artists the secrets of British Freemasonry. The songs, "Hiram Abif," and "Kill the Spider," are about the central hero of modern freemasonry, Hiram Abif, who was murdered in King Solomon's Temple before it was completed. 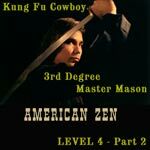 LEVEL 4 = Kung Fu Cowboy PART 2: 3rd Degree Master Mason continues the masonic story of Hiram Abif's murder. The first song of the album, "3rd Degree Master Mason," is the execution of the three murderers of Hiram. "Masonic Kung Fu" is a musical expose of the "Masonic Kung Fu" form discovered by Buddha Zhen. We have very exciting videos planned for these two songs that will be of interest to every Mason in the world. This album was supposed to be released in 2011 but Coyote's family broke up and after leaving for Las Vegas, the day before Christmas 2011, Coyote has yet been able to set up the Shaolin Records studio, kept in storage. With only a few songs requiring flute overdubs, song mixing and album mastering to go... this album has been 3 weeks from final release since September 2010. 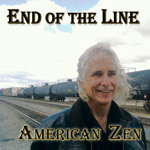 End of the Line, was the album written by Coyote after the recording of Kung Fu Cowboy PART 2. With Coyote nomadic, travelling between Las Vegas and San Diego, it did not seem this album was part of the previous American Zen journey. Since Coyote had many songs planned for the Kung Fu Cowboy PART 3 album, Shaolin Records released this album of songs written by Coyote from 2012 and 2013 as the End of the Line album by American Zen. This is an album of survival and about Coyote's authoring the screenplay, Kung Fu Cowboy Rock & Roll Movie 1. The songs, "Secret Asian Girl," "Rock Me Hard," "Kung Fu Cowboy 2," "Take Me Apart," "Black Hills Ride," "Starting Over Again," and "Scorpion Resurrection," were written for the Kung Fu Cowboy movies and the imaginary characters of these screenplays as Coyote completed the initial script, Kung Fu Cowboy Rock & Roll Movie 1, then fleshed out the three sequels in 2013. The wedding song, "Honor and Obey, Cherish and Protect," was written for the Kung Fu Cowboy Rock & Roll Movie 4. American Zen is led by The Hippy Coyote who fronts the band on Yamaha flute and Fender 1984 Floyd Rose Stratocaster electric guitar with a tobacco finish. 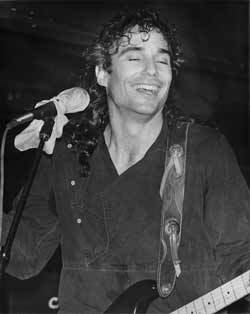 From 1992 until 2009, Coyote fronted the American Zen band playing an Alvarez 12-string acoustic guitar and his1975 nickel Selmer-Bundy flute. Coyote is a renaissance man who writes all the music, lyrics, and poetry. The End of the Line album was recorded in Coyote's truck, "Tacoma Studios," during February 2014 and was released on July 4, 2014 by Shaolin Records. The Hippy Coyote "Kung Fu Cowboy"